The Kelp Gull is the second largest gull in the region, being smaller and less bulky than the Pacific Gull and with a less massive bill. Its tail is all white, with no black band. The Kelp Gull has become established in Australia since the 1940s, with the first breeding recorded on Moon Island near Lake Macquarie in New South Wales in 1958. Their numbers have increased rapidly since the 1960s and they are now common in many parts of the south-east and south-west coasts, and especially in Tasmania. It is widespread in New Zealand, and is found on most sub-Antarctic islands, as well as on islands south of the Antarctic Convergence and the Antarctic Peninsula, South America, and Africa. The Kelp Gull prefers the sheltered parts of coasts such as bays, inlets and estuaries; also beaches and reefs on off-shore islands. It is likely that the Kelp Gull is in serious competition with the endemic Pacific Gull because of their similar habitat, food and habits. 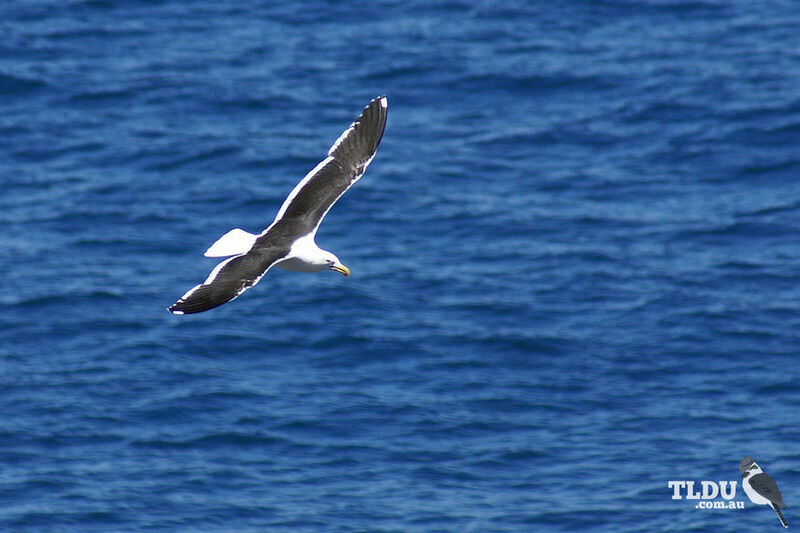 The Kelp Gull is resident in many parts of Australia, in others it is dispersive although this varies from colony to colony. In some colonies, parts of the population are apparantly resident or sedentary. The Kelp Gull forages on land or in water, rarely in the air. It feeds mainly on fish and crustaceans, but will scavenge when an opportunity arises. Like the Pacific Gull, the Kelp Gull habitually drops molluscs from midair onto rocks to smash them. The Kelp Gull nests in loose colonies or scattered single pairs on off-shore islands where breeding birds maintain large territories against other gulls.The nests of Kelp Gulls can be a well-made bowl of plants stems, grasses and seaweeds or a loose pile of material on the ground, near rocks or in a tussock. Both the adults build the nest, incubate the eggs, brood and feed the young. Kelp Gulls occasionally become entangled in fishing lines, are occasionally illegally shot, and have been poisoned. In New Zealand, the Kelp Gull was regularly eaten by the Maori.